"Dad, can I wear these shoes to the store?" "No, but you can keep your princess dress on." "No princess shoes on the steps!" "Hey! Da-a-a-a-a-d! He took my shoes." "Dude. For real? Give your sister back her shoes." "Why are there shoes in your bed?" "I wanted to sleep with them." I don't think there is anything more adorable than my four-year-old daughter carefully walking around in high heel shoes. She loves all her fancy shoes. I've lost count of how many pairs she owns. But, every girl needs another pair. Right? 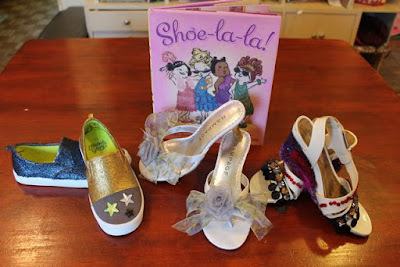 This week, our birthday celebration activity for LeUyen Pham had my daughter (...and son) smiling, feeling proud, and saying "Shoe-la-la" after adding a new pair of shoes to their collections. LeUyen Pham (pronounced Le Win) is the illustrator of over 80 books for children including Bedtime for Mommy written by Amy Krouse Rosenthal, Piggies in a Polka written by Kathi Appelt, and Grace for President written by Kelly DiPucchio. At the age of two, LeUyen and her family left Vietnam near the end of the War and found a home in California. As a child, she was a voracious reader and spent her Saturdays at the library lost in books like Where's Wallace? by Hilary Knight and The Westing Game by Ellen Raskin. (Mazza Museum Keynote). As much as she loved reading she loved drawing even more. She sold doodles of Star Wars, Garfield, and Calvin and Hobbes to her classmates for a quarter and is thankful her teachers fostered her artist talent, "There wasn't a single year in my school age when I didn't have at least one teacher encouraging me to draw and cultivate my art. Which was important, because my family didn't really give much value to art. I always loved that my teachers gave me sort of a safe haven to dream and to pursue what I loved so much, even at a super young age." (EW). Later, LeUyen attended UCLA to study Political Science. However, a professor noticed her artistic talent and referred her to Art Center College of Design in Pasadena where she received a scholarship. While at art school she earned an internship with SGI, the animation company behind the first Jurassic Park movie. (The Noe Valley Voice). After she graduated she worked for DreamWorks Animation in the layout department for the movies The Prince of Egypt and The Road to El Dorado. She learned a lot at DreamWorks, especially how to draw quickly, but the animation industry was changing and LeUyen wanted to work as a freelance illustrator. (Patricia Newman). 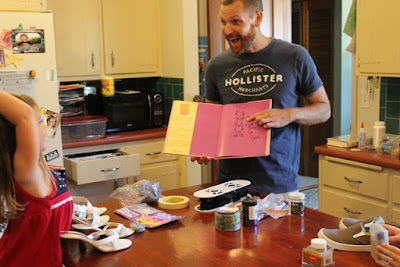 While still at DreamWorks, she landed her first book deal to illustrate the chapter book The Sugarcane House: And Other Stories About Mr. Fat written by Adrienne Bond (1997). That book led to Can You Do This, Old Badger? written by Eve Bunting, her first picture book, and a few more contracts. 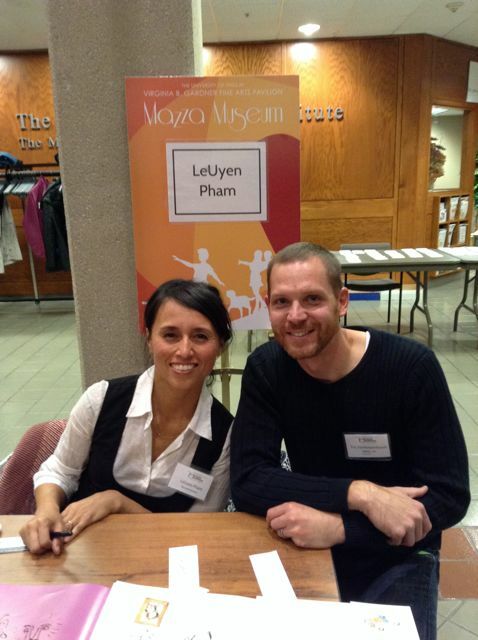 LeUyen was able leave DreamWorks to work as an illustrator. 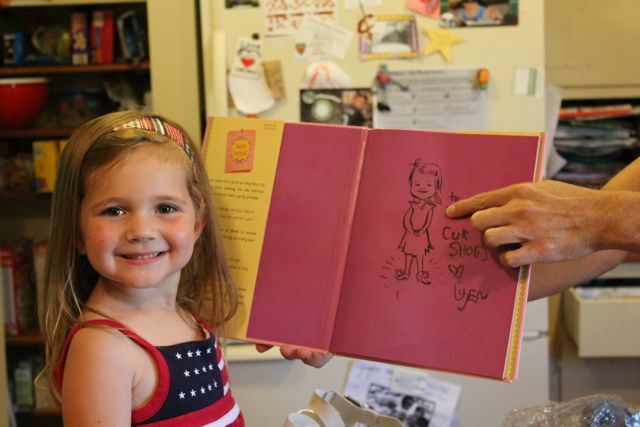 LeUyen is prolific illustrator. 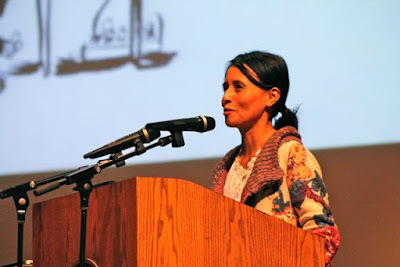 She produces three or more books each year and takes great care to "present as many multicultural races as possible" with the goal of "where any child can look at an image and not necessarily identify it as a particular race, but to identify themselves in it." (Scholastic). 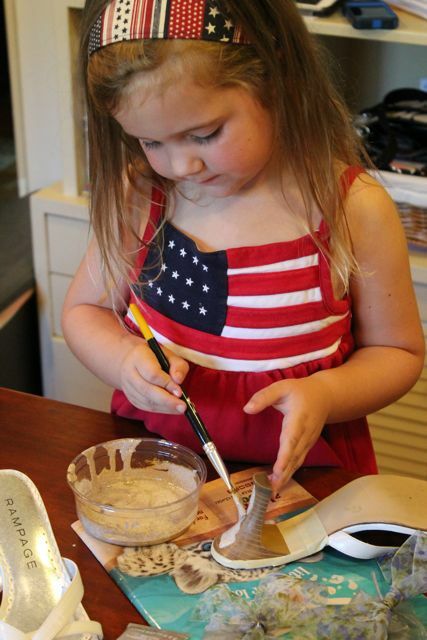 She told the audience at the Mazza Museum, "When I draw anything. It is a little piece of me." Her latest picture book is Freckleface Strawberry and the Really Big Voice written by Julianne Moore. Wow! An amazing artist and a champion for diverse books. 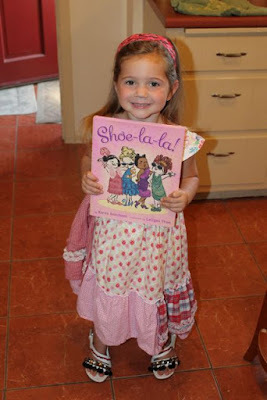 Shoe-la-la!, written by Karen Beaumont, inspired our birthday celebration activity for LeUyen Pham. 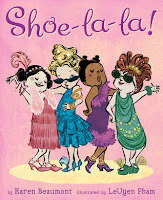 In this book, four girls, Emily, Ashley, Kaitlyn, and Claire head to the shoe store to find the perfect pair. 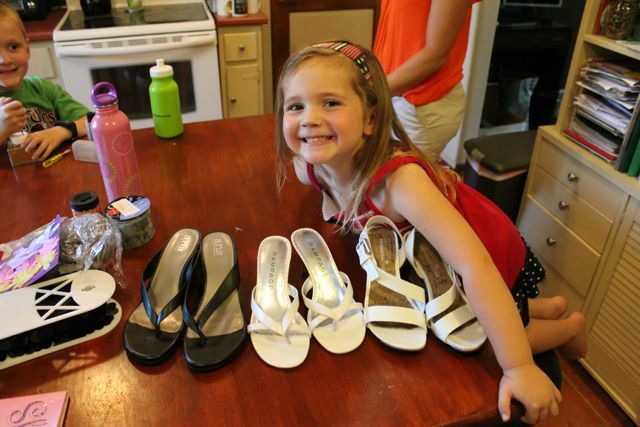 The girls try on a variety of shoes, much to the frustration and exhaustion of the store clerk, but they can't find a single pair to buy. Back at home, disappointed, one of the girls has an idea. 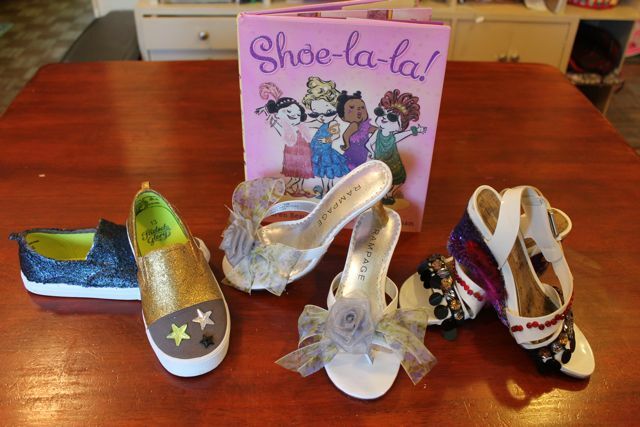 With paint, pom-poms, gems, beads and bows the girls transform their plain shoes into something glamorous! 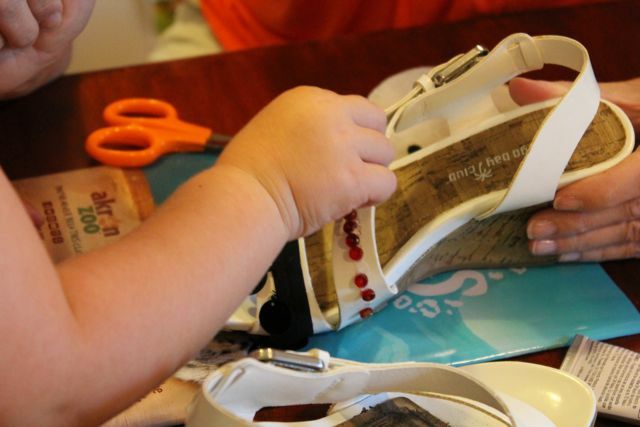 Our family couldn't resist this crafty idea! We had to try! 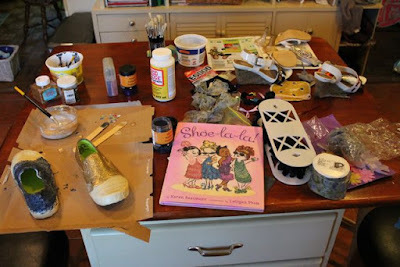 We found a few pairs of high heel shoes at the thrift store. 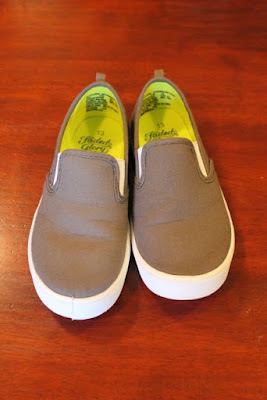 I knew my youngest son would love this activity, so I bought an inexpensive pair of canvas shoes at Wal-Mart. My daughter was so excited to see the drawing from LeUyen in our copy of Shoe-la-la!. At the Mazza Museum, LeUyen did portrait drawings for anyone who wanted one in their book. All she needed was a photo, so I showed her one of my daughter on my phone. How cool is that! 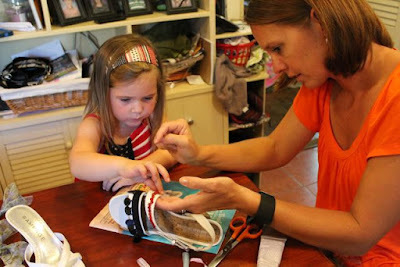 We gathered goodies from our craft bins to decorate the shoes. I found a video sharing how to add glitter to a pair of canvas shoes. I showed it to my son and he was beyond excited to try it. We started by taping off the white bottoms of his shoes so they wouldn't get covered with glitter. My daughter made a plan with Mom. 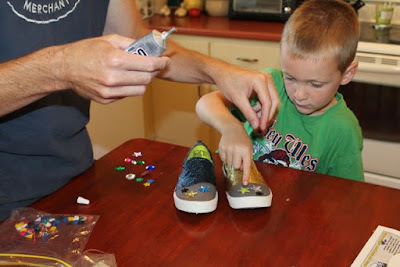 My son wanted to add gems and other things to the tops of his shoes. 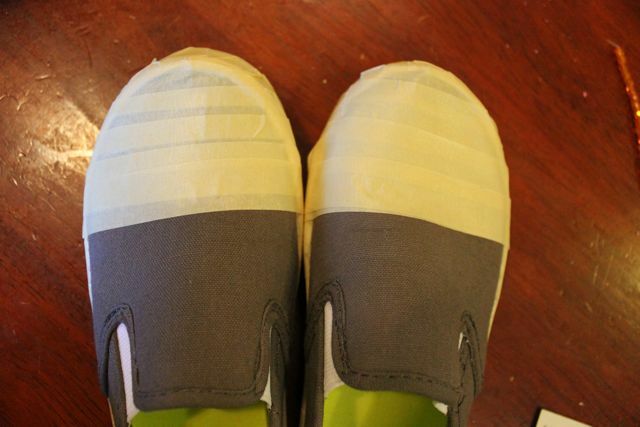 We taped over the front part of the shoes to prevent glitter from getting there too. 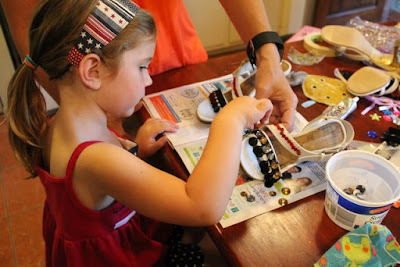 My daughter added beads and fancy ribbon to the straps. We used E-6000 adhesive as the bonding agent. 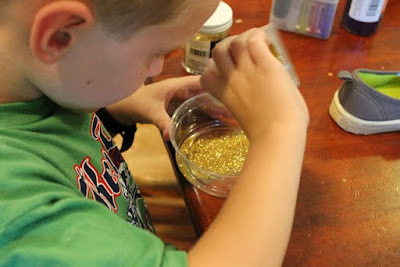 While my daughter worked with her mom, I helped my son prepare his glitter mixture. He poured a generous amount of fine gold glitter into a bowl. 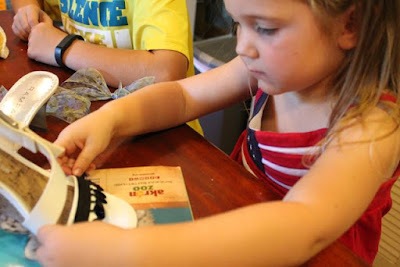 Then, mixed in Mod Podge with a craft stick. 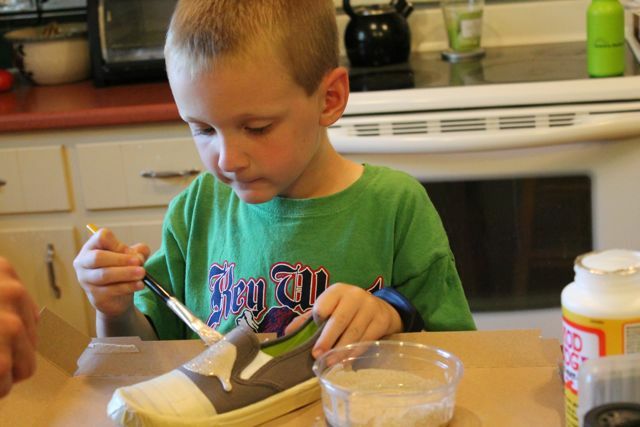 He painted the mixture onto the shoe. She was still working hard. Thankfully, mom was still on summer break and was able to help with this craft. She loved her first pair. 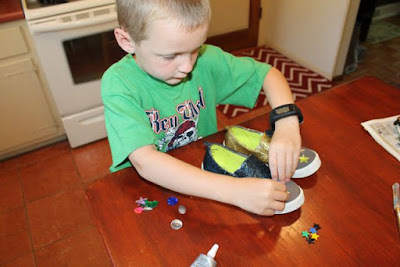 My son allowed the first coat of glitter to dry and then he added another coat. At this point, he had two colors of glitter going at the same time. My daughter saw how much fun her brother was having and she decided to add gold glitter to the heels of another pair of shoes. 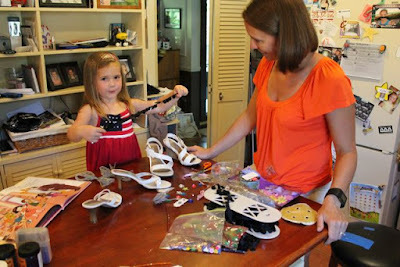 Then, she found more gems and added those to the first pair. 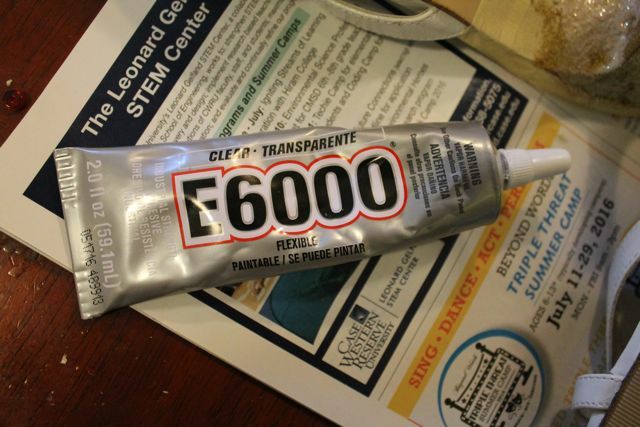 This is a photo of the E-6000 clear adhesive. 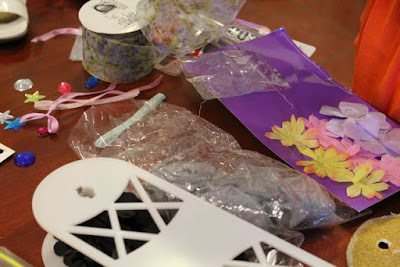 We found it at Michael's craft store. 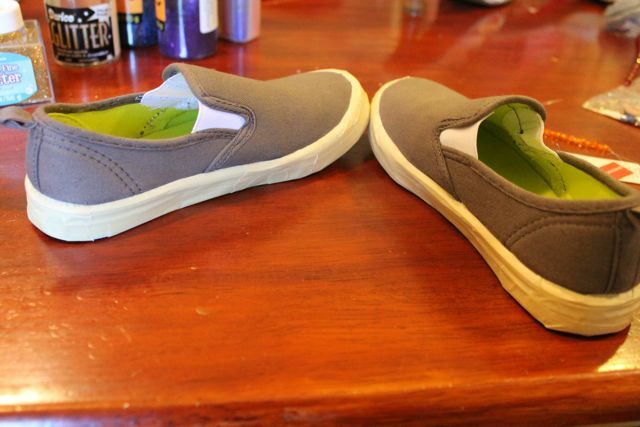 We let the shoes dry overnight. Then, we removed the tape. They looked pretty good. 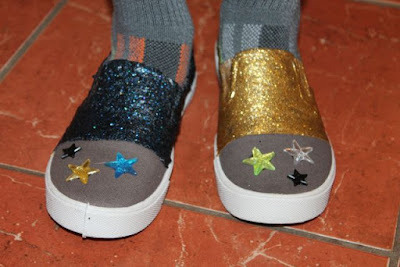 Notice that he used two different types of glitter. 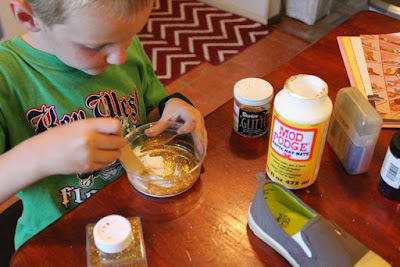 The gold glitter was finer and tuned out smoother. 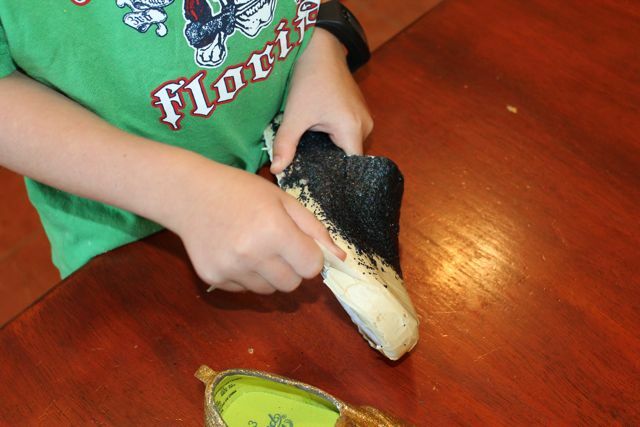 The black/blue glitter was traditional glitter and it had a more bumpy finish. He planned the location for a few colored stars. I helped with the adhesive. 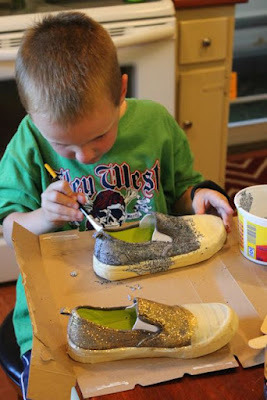 He said, "I am going to wear these shoes on the first day of school. And I can where them to art class, because they are piece of art." LeUyen, thank you for sharing your birthday with us! We hope you have a glamorous birthday!